Should You Forget Gold, and Hoard Pennies Instead? Home › Investing › Should You Forget Gold, and Hoard Pennies Instead? Tangible assets, like gold and copper, are becoming increasingly popular. You’ve probably heard a lot about the interest in physical gold. Indeed, many are buying gold coins and considering selling their gold jewelry (or, better yet, hoarding their gold jewelry). With the price of gold well above $1,700 an ounce, and gold bugs insisting it will go higher, it is tempting to buy gold. But what if you don’t have enough money to invest in physical gold? There are less expensive alternatives, like silver, but one type of metal becoming more popular is copper. Penny hoarders are looking for ways to cash in on the fact that the price of copper is rising — and if you are prepared for the future, your pennies could be worth more than one cent. Which Pennies are More Valuable? Before you get too excited and start picking up every penny you find, it’s important to understand that not all pennies are the same. 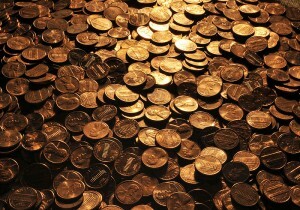 Pennies produced starting in 1983 are made mostly from zinc. If you want a penny that is 95% copper, you need to look for coins that are dated 1982 or older. The zinc pennies aren’t nearly as valuable; in fact, some copper pennies are going for as much as $2 apiece. Buying pennies is more affordable than buying gold, though, and they can be a little easier to store — at least you don’t have to worry as much about theft. There are also businesses that will store large bags of copper pennies on your behalf in secure locations. Companies like the Portland Mint make it more affordable to invest in certified pennies. You can order boxes of them delivered to you, or you can store it. However, as with companies that store gold for you, most facilities that store copper pennies on your behalf will also charge you a fee. Before you decide on such a company, though, it is important to double check to make sure the company can provide what it promises. This is also important if you buy pennies online. Some sellers will send you a mix of “copper pennies” and “zinc pennies.” You want a guarantee that your pennies are all going to be mostly copper if you go this route. Otherwise, you could end up overpaying for pennies that are worth much less. Right now, penny hoarding is mostly about the future. If you have a lot of pennies, you can sell them to others for up to twice their face value, but that’s about as far as it goes. The law prevents you from leaving the United States with more than five dollars in pennies, and it’s illegal to melt down U.S. coins used as legal tender. So if you have pennies, it’s more of an investment strategy against the future. But, what is the fate of the penny? Efforts to re-evaluate our coinage are underway, and some think that we would be better of financially to abolish the penny. If this happens, then things could change. Melting down pennies would be acceptable, and you could sell pennies as raw copper — cashing in. And, of course, like all metals with value, there are those who are interested in a tangible asset, just in case everything goes to hell in the next few years. Tangible assets like gold, silver and copper pennies might be worth a lot indeed if the complete meltdown of our system occurs like some believe. You can help shore up your retirement with a little help from pennies. On the other hand, though, it’s important not to become to focused on one type of investment. Things could turn around. Gold (and silver and copper) prices could plummet instead. If you are looking for a way to bulk up your tangible investments, it might be worth it to look into pennies. A little diversity doesn’t hurt. However, like most investments, it’s important not to get too carried away with one asset class. 3 Responses to Should You Forget Gold, and Hoard Pennies Instead? That is very interesting. I didn’t realize that about pennies. I am probable going to start looking at the date when I get pennies now, not sure if I will actually hold onto them though. $10000 in pennies takes up roughly 120 gallons assuming no space between them; 150 gallons of storage space is a more realistic number. I’ll stick to treasuries since a couple of 55 gallon drums would not fit with the interior decorating in my place.